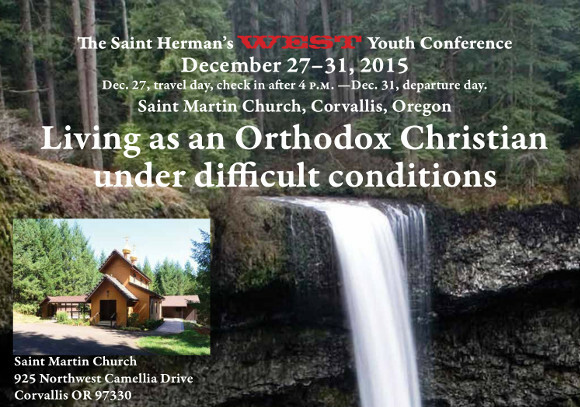 St. Martin the Merciful in Corvallis will host the 2015 St. Herman West Youth Conference, from December 27–31. Western American Diocese of Russian Orthodox Church Outside of Russia (ROCOR) has sponsored, for the past eight years, a youth conference in late December dedicated to St. Herman of Alaska. These conferences were originated in our Eastern American diocese, and the concept was successfully transplanted here – i.e. our version is the St. Herman 'West' Youth Conference. These Conferences are targeted at youth 15-25, although we usually have younger participants with sufficient maturity to take part. These conferences are scheduled for three full days (with travel days before and after), and typically have had outstanding programs of prayers, services, speakers, social, educational, and recreational activities. They are typically housed at a conference hotel, with most activities taking place at a sponsoring parish nearby. Our theme this year is timely, given the legal and social changes of the past year: "Living as an Orthodox Christian Under Difficult Cultural Conditions." The opening talk will be given by Matushka Elena Perekrestov of San Francisco, on the life of the newly-glorified St. Alexander of Munich, executed by the Nazis for his role in the anti-Hitler White Rose Movement. The second talk will be given by Fr. Timothy Pavlatos, on the theme "Worldly Conforming to Christly Transforming." The closing talk will be given by Fr. James Baglien, entitled "Homosexuality: An Orthodox Christian Perspective." The cost to attend is $210, all inclusive. Please register at www.wadyouth.com by December 15th. This entry was posted in retreats, youth events and tagged Corvallis, retreat, St. Herman's West Conference, youth. Bookmark the permalink.